Reeses Milk Chocolates (150g), Lotte Chocopie (168g), Fibisco Assorted Biscuits (500g), Gandour Cake (12s) and Bear. Delivery date,greetings message and any other special instructions for this gift, You will be prompted a link after order processed page. 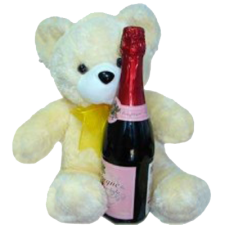 1 bottle of champagne soda 750 ml with approximate 17" size cute teddy bear. Bear w/ heart shape ferrero chocolate Please Note: Bear design may vary. 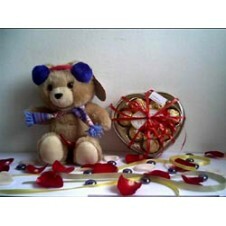 Bear w/ heart shape ferrero chocolate. 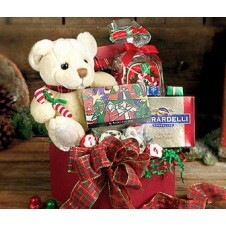 A special gift for a special person on their special day- Our festive plush snack pack w/ Bear sits front, and surrounded by an array of delicious snacks and treats. 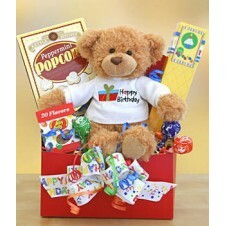 Get the party started with Popcorn, Jelly Beans, cookies and lolly pops! Contents: • Plush Bear • Popcorn • Cookies • Jelly Beans • 3 Assorted Tootsie Pops Substitution Policy: - Substitutions may be necessary to ensure your arrangement or specialty gift is delivered in a timely manner. The utmost care and attention is given to your order to ensure that it is as similar as possible to the requested item. 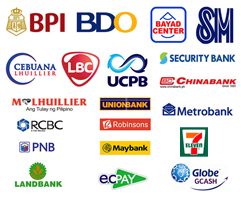 Specialty gifts may be substituted with another specialty gift of equal or greater value and of similar theme and category in case the requested product is not available. 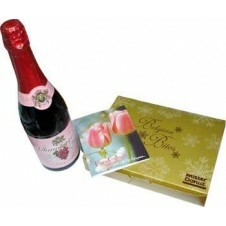 Belgian Bites 1 dozen from Mister Donut with 1 bottle champagne soda 750 ml. Color blue! 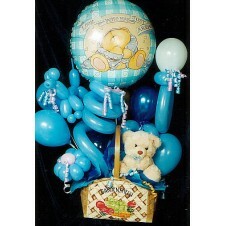 A sweet teddy bear with 1 pc mylar ballon and various size latex balloons makes this arrangement so sweet for a sweet person! 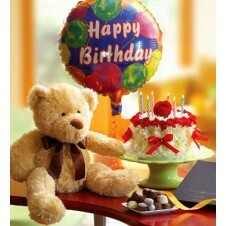 Brighten their day with a plush character, mouthwatering Lindt chocolates and a festive Mylar birthday balloon. To add the perfect finishing touch, we've included our signature Birthday Flower Cake, made using the freshest pastel-colored carnations, pompoms and more! Cake plate not included. Please Note: Components may vary. Contents: Toblerone 50g 3's Ferrero Rocher Chocolates 37.5g Hersheys Kisses 36g Champola Choco Cluster 60g Kitkat Bites 40g Cadbury Fruit & Nut 40g Vanhouten Assortment 90g Cadbury Fruit and Nut 65g Goya chocolate box Substitution Policy: - Substitutions may be necessary to ensure your arrangement or specialty gift is delivered in a timely manner. The utmost care and attention is given to your order to ensure that it is as similar as possible to the requested item. Specialty gifts may be substituted with another specialty gift of equal or greater value and of similar theme and category in case the requested product is not available. 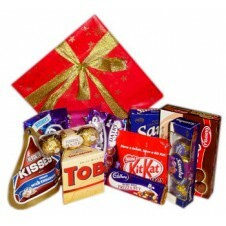 Assorted chocolates & nuts decorated with red ribbon. 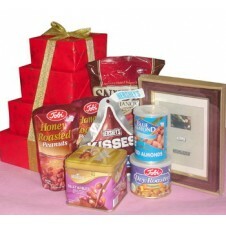 Contents: Vochelle Chocolates 180g in Tin Can Hersheys Kisses in a Pack Pretzel Pack 2pcs Tobi Honey Roast Nuts Tobi Dry Roast Nuts Blue Diamond Roasted Almonds w/ Picture Frame Substitution Policy: - Substitutions may be necessary to ensure your arrangement or specialty gift is delivered in a timely manner. The utmost care and attention is given to your order to ensure that it is as similar as possible to the requested item. Specialty gifts may be substituted with another specialty gift of equal or greater value and of similar theme and category in case the requested product is not available. 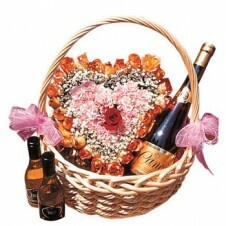 Heart shaped basket full of roses, choice of red, pink, peach, yellow with inner flowers. this item comes with Sparkling red grape juice. Hershey's Big Kiss. 1 BIG KISS in a box. Solid milk chocolate. 198 g. w/ 8 inches teddy bear Please Note: - If BIG Kiss is not available, a pack of 235g small kisses will be delivered with same or higher value. 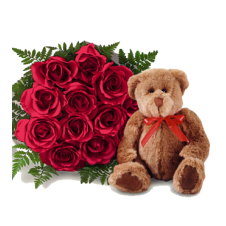 - Teddy Bear Design May Vary Delivery date, greetings message and any other special instructions for this gift, You will be prompted a link after order processed page. Hugs and Cookies with white bear. Provincial order will be charged additional $6.95/Order. 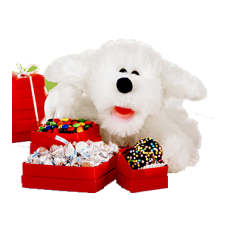 They'll fall in love with this soft, cuddly puppy combined with hugs and sweets. We've filled a stack of boxes with delicious treats. An irresistible hand-made combination of two chocolate-dipped Oreos®, a medium box filled with M&M's®, and a larger box filled with chocolate kisses. This collection of assorted candies makes a sweet surprise. Mini Heart Chocolate Chip Cookies w/ Bear by Mrs. Field One will not have enough of these chewy heart-shaped delectables. With lots of real semisweet chocolate chips. Twenty-four bite sized pieces are packaged in an elegant tin. Available Sizes: - 24 pcs bit size chocolate chips - Small Size Bear Please Note: Please place your order 3 days before the date of delivery for production time requirement. 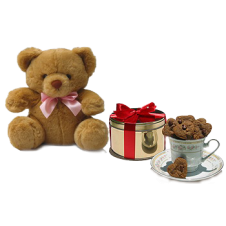 Pink bear with cookies Provincial order will be charged additional $6.95/Order. 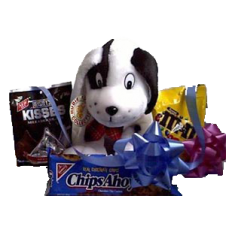 Puppy Hugs w/ m&m's, zachary fruit slices and zachary chocolate coated pretzel Provincial order will be charged additional $6.95/Order. 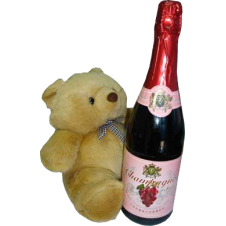 1 bottle of champagne soda 750 ml with small size cute teddy bear. 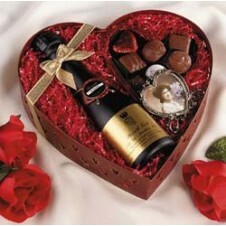 Welch red grape juice with Milk Tray chocolates and a small picture frame in a heart shaped box or a basket, decorated with ribbon and cut of japanese paper. 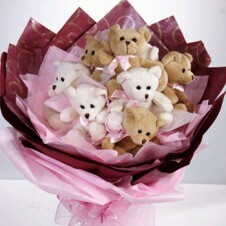 This is a special valentine's gift item for a special person. 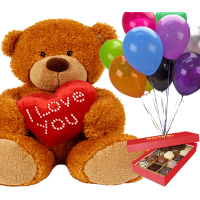 This romantic gift box contains a cuddly teddy bear (17" tall) with 2 heart shape balloons & heart shape Hershey's Kisses Chocolates (235g). 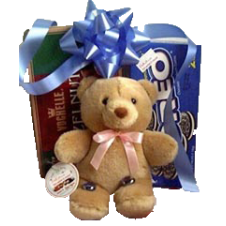 Teddy Bear with Heart shape Fererro Chocolate Delivery date,greetings message and any other special instructions for this gift, You will be prompted a link after order processed page. Twin Bear with Balloon. 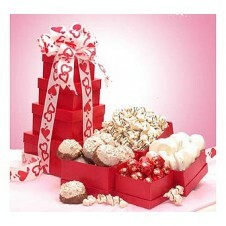 Available balloon- Valentines, Be mine, I love you, Birthday etc) added Hershey's Kisses 120g! Please Note: Bear color may vary. White Bears with One Box Cookies.